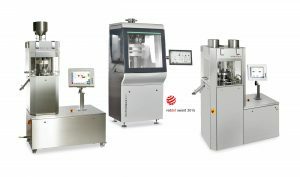 Fairfield, NJ – MG America, the U.S. subsidiary of MG2 of Bologna, Italy and a leading supplier of processing and packaging equipment, has become a distributor in the U.S., Canada and Puerto Rico for a line of tablet presses from Germany-based machinery manufacturer kg-pharma. The new relationship marks MG America’s first foray into the North American tablet press marketplace. also is available on each press. With the RoTab Bilayer, kg pharma’s “miniaturized production” design concept enables smooth, fully transparent scale up. Various punch formats can be used, and a complete form part change can be conducted in under 45 minutes. The RoTab Bilayer is also designed for operation with only one occupied punch station. The sampling for the first layer is possible at the push of a button during production. Anti-cross-contamination minimizes a “mixing” of the layers thanks to two separated suction bars. The mobile, compact unit weighs a mere 1,300 kg. Each of the three tablet presses from kg-pharma shows its benefits from pre-production phases and R&D stages through production itself. They are ideally suited for scale-up purposes and production optimization, offering substantial potential savings through this versatility. Each also offers intuitive interaction via an 18½-inch HMI screen and smartphone-enabled remote operation.